DFM Announces a New Product! The Americans With Disabilities Act (ADA) requires access to public facilities for the handicapped. 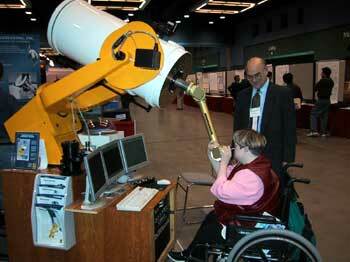 Up to now, getting a wheelchair bound person to the eyepiece of a telescope was very difficult and expensive. DFM Engineering, Inc. announces the availability of an Articulated Relay Eyepiece™ (ARE-125™) that allows handicapped access to the eyepiece for most telescopes. The Articulated Relay Eyepiece™ uses a series of relay lenses and folding mirrors to reposition the telescope focal plane a considerable distance from the tail piece of the telescope. Mechanical and optical swivel joints allow the ARE-125™ to pivot freely in 3 axes. 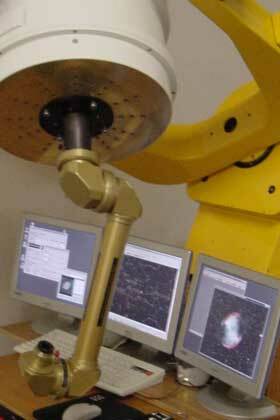 A person seated in a wheel chair may simply pick up the eyepiece and bring it to their eye for convenient viewing regardless of telescope position. 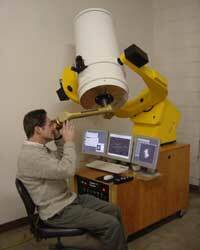 The ARE-125™ attaches to the telescope using a standard 2 inch eyepiece adapter. A standard 1.25 inch eyepiece may be inserted into the eyepiece assembly. The light loss is minimized by using high reflectance coatings on the folding mirrors and broad band anti-reflection coatings on the relay lenses. 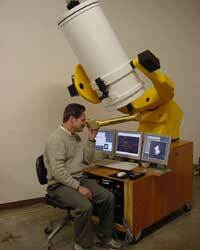 The telescope resolution suffers only minimal degradation. 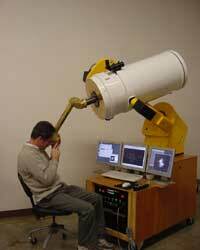 The ARE-125™ accepts an F/8 or slower beam from the telescope. NOW YOU CAN FULFILL THE "AMERICANS WITH DISABILITIES ACT" ! 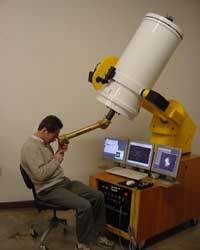 The ARE-125™ will be on display attached to a DFM 16" telescope at the 201st AAS meeting from January 5th - 9th, 2003.